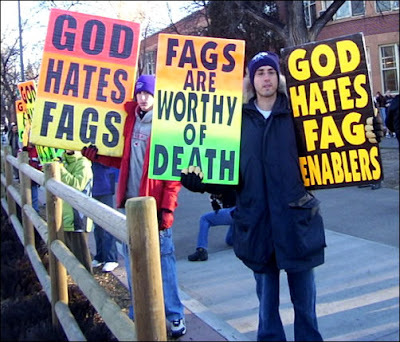 The Midnight Review: Will Westboro Baptist Church Protest Violate Florida's Anti-Bullying Law? Will Westboro Baptist Church Protest Violate Florida's Anti-Bullying Law? Do these protests fall under the definition of HB 669? Hot off their legal victory, the Westboro Baptist Christian cult has decided to go on and continue exercising their right to hate, but one location in their upcoming schedule stood out from the rest, and that is because it is a school, and not only any school, but my school. That’s right. These vile religious extremists are protesting my old stomping grounds, Dr. Phillips High School, in Orlando, Florida on April 29. Why are these crazies picketing a school of all places? While they may have won their right to spew hatred from the sidelines of funerals, it is my belief that these freaks are violating Florida’s anti-bullying laws. If you ask me, having a extremist Christian church chant derogatory terms directed towards students while they head to school would constitute as bullying and harassment, per the statutory definition, and should this church show up ready to protest, they should be arrested for directing their hate towards America’s youth, violating Florida law in the process. Let’s see if Orlando’s elected officials will do anything to protect our students from this cult. Contact them today!